This is a wrongful death surgical malpractice case filed on behalf of a man in Anne Arundel County. It was filed in Health Claims Arbitration on January 12, 2017. The lawsuit alleges that the patient had unnecessary surgery that was counterindicated by his poor health. This case is the sixteenth medical malpractice claim filed in Maryland in 2017. Decedent is admitted to Anne Arundel Medical Center (AAMC) with chest and abdominal pain. He is there for a week while the doctors evaluate him and review images of his abdomen and pelvis. These reveal several small gallstones. None of these block a bile duct, and there is no evidence of an infection of the bile duct or gallbladder. The admitting hospitalist requests a cardiology consult, but does not believe further intervention is necessary. The following day, a cardiologist sees decedent. She finds symptoms consistent with an ongoing cardiac problem, such as elevated troponin and increased shortness of breath. The cardiologist also notes that he is not demonstrating symptoms associated with gallbladder disease. Decedent is evaluated by a physician assistant the same day, who notes that although decedent did have abdominal pain, it was not located where patients with gallbladder issues typically experience pain. She consulted with an on-duty surgeon and hospitalist, who conclude together that his symptoms were due to gallbladder conditions. Although the cause of his pain is unclear, his abdominal symptoms resolve. His blood pressure begins to fluctuate. He is seen by defendant surgeon, who writes that there is no evidence of acute cholecystitis or acute obstruction. Defendant surgeon has no plans for decedent to have surgery during the current hospital admission. Decedent is evaluated by another hospitalist, who characterizes his scan as showing a slow and poorly filling gallbladder. He tells defendant surgeon that the decedent's gallbladder was going to need to come out soon. Defendant surgeon examines decedent again, who suggests to decedent that he is at risk for developing worsening gallbladder disease in the future since he has a history of diabetes. He says that removal of the gallbladder might not be an unreasonable, since the source of his abdominal pain is unclear. 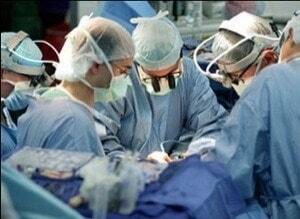 Disregarding his note from his prior exam of decedent, defendant surgeon schedules decedent for surgery. Defendant cardiologist is asked to evaluate decedent. Defendant cardiologist cancels the first scheduled surgery, as decedent's blood pressure was too low. He does evaluate the decedent, however, and concludes that he is a high risk surgical candidate, due to multiple cardiac problems and comorbidities. He adds that although he is high risk, there is no cardiac contraindication to his surgery. Defendant surgeon records many reasons to not perform surgery on decedent at this point, including hypotensiveness and an absence of acute cholecystitis. Despite this, he decides to move forward with the surgery, although decedent does not have the typical presentation for gallbladder removal surgery. The gallbladder removal surgery is completed. Shortly after, decedent's blood pressure drops and he becomes hypotensive. The next morning, he suffers a heart attack. The nurses find him unresponsive and without a pulse. He is brain dead, and placed on a ventilator in the ICU. He is taken off the ventilator a few days later, and subsequently dies. The first question is this case is whether, setting aside the cardiac issues, a lap chole was appropriate for this patient. Based solely on these facts, this is likely to be a jump ball question. Plaintiffs typically lose on jump ball question in Anne Arundel County. You do not want to try a case in Annapolis premised on a doctor's judgment call on whether a lap chole was generally a good idea for this patient. So the battlefield is whether THIS patient should have gotten a lap chole given his cardiac condition and the fact that he is a high risk patient. I think it is tough to know based on these limited facts. Ultimately, the jury question is going to be was this a freak one-in-a-million type occurrence or is this something that could have been avoided with a more cautious approach. There is an informed consent count so there could be powerful argument with respect to giving the patient a choice given seems to be inarguably a material risk. This is yet another medical malpractice case filed on the eve of the statute of limitations. Miller and Zois has a long history of achieving substantial verdicts and settlements in medical malpractice and hospital malpractice cases in Maryland. Our law firm can help you get the justice and compensation that you deserve. Call our attorneys today at 800-553-8082 or go online for a free case evaluation.